AIPEU P3 CHQ: VERIFICATION OF MEMBERSHIP FOR RECOGNITION OF SERVICE ASSOCIATION UNDER CCS (RSA) RULES, 1993-CALLING OF APPLICATIONS-REGARDING. 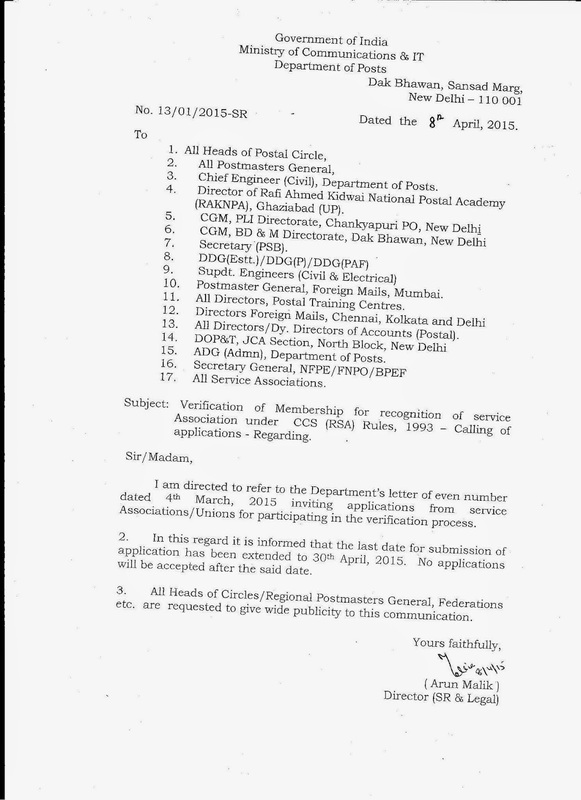 VERIFICATION OF MEMBERSHIP FOR RECOGNITION OF SERVICE ASSOCIATION UNDER CCS (RSA) RULES, 1993-CALLING OF APPLICATIONS-REGARDING. LAST DATED FOR SUBMISSION OF APPLICATION HAS BEEN EXTENDED. NOTE: FOR PERSONAL ATTENTION OF ALL GENERAL SECRETARIES / CIRCLE SECRETARIES / DIVISIONAL AND BRANCH SECRETARIES OF ALL NFPE AFFILIATED UNIONS. 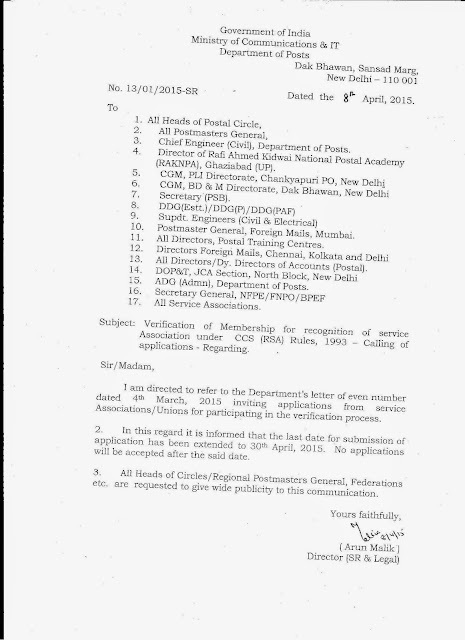 As the date of obtaining applications from applicants all India Unions has been extended up 30th April 2015 by the Department of Posts . It has come to our notice that some external disruptive forces who do not believe in democratic process and in principles of Trade Union Movement want to create some obstacles in membership verification process. Therefore all of you are advised to get the modification/change/new enrollment of new entrants and non-members done on existing letter of authorization up to 30th April, 2015.